I met Sophie through mutual friends in fitness, and immediately I knew she brought something special to the fitness industry. She has a warm energy, a calming disposition and an unflappable commitment to her clients and the practice of yoga. I’m really excited to partner with her for a special Bootcamp & Bend event on Saturday 17 September. 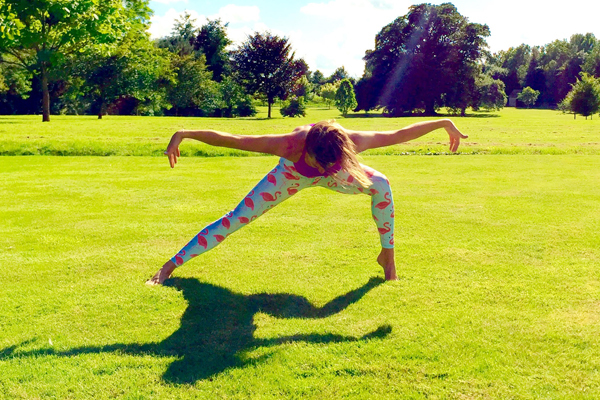 After 45min of high-intensity bootcamp with me, Sophie will be taking the crew through a series of flowing vinyasa style stretches and yoga sequences to lengthen the body, open the mind and leave you feeling strong and balanced as you take on the weekend. It’s the ideal opportunity for keen bootcampers to try their hand at yoga, and for dedicated yogis to enjoy the intensity and teamwork of bootcamp. Here Sophie shares a little more about herself so you can get to know her before joining us next Saturday! When & why did health and wellness start to become a top priority for you? I have always enjoyed exercise, especially at school. However until just over a year ago I was living a pretty unhealthy lifestyle. Working all hours as an Assistant Director in TV meant that I never had time to exercise. I was so exhausted that I didn’t put much thought into what I ate and wellness just wasn’t a priority. After 8 years in the industry my body began to give up on me, and after a bad period of insomnia I came to the realisation that things really needed to change. So I quit my job – a tough decision at the time – and once I started on the road to getting fit and healthy again I haven’t looked back. How often do you personally practise yoga, and what benefits does a regular practice offer you? I try to practise 4 times a week and I would love to practise more but sometimes I find it difficult to fit my own practice into a busy week! A regular practice helps me stay grounded, it helps me switch off from the business of life, it helps me feel more open in my body and mind, and most of all it helps me feel balanced. Dynamic and energetic with fun and creative sequences that will make you feel revitalised and glowing! What’s your most exciting fitness career highlight to date? 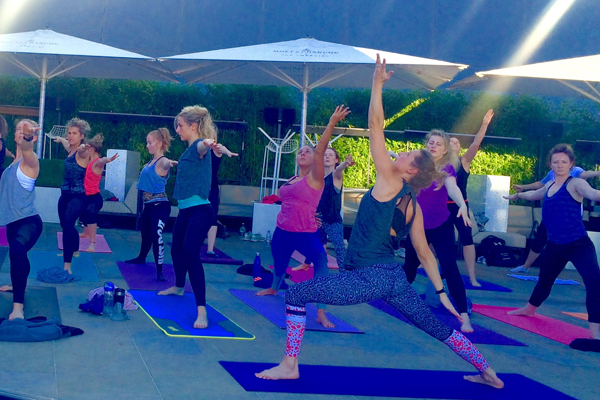 Having 56 people turn up to my Lululemon class this summer was pretty special! Who do you look to for inspiration in the fitness industry or in the business of fitness? I look to both the teachers that I assist for – Julie Montagu and Rachel Okimo. I love their different styles of teaching and both of them have inspired me to be the teacher I am. Which yoga pose makes you feel strongest? Crow pose – I really used to struggle with this pose as I had such weak shoulders and arms (I found it hard to do a press up for a long time!) so it reminds me how far I have come and how with practice and determination you can achieve anything. What fitness discipline pushes you most out of your comfort zone? Probably bootcamp! I find high intensity training very tough and I have to remember that the mind gives up way before the body does. How would you describe the London fitness scene compared to other countries and cities around the world? I can only really compare it to Australia – where I received my yoga qualifications – and I would say that we have a bit of catching up to do here in London. In Sydney and Melbourne fitness and wellness seems much more accessible and affordable. Of course the good weather encourages people to be outside and be more active. But there also seems to be a real consciousness around healthy eating and an acceptance of different dietary requirements. What excites you most about the upcoming Bootcamp & Bend event? I am looking forward to uniting bootcamp with yoga! It will be fun and interesting motivating a whole group of people after they have had an extremely energetic workout…. I also hope that the people who may not have tried yoga before but are more of the ‘team bootcamp’ will be pleasantly surprised at how dynamic and energetic yoga can be. I am really looking forward to being part of a new type of workout, creating something exciting and fresh…and hopefully Bootcamp and Bend will have many more interesting events to come! Find out more about Bootcamp & Bend and secure your spot (spaces are going quick!) before they’re gone. We look forward to meeting and training with you! thank you for this nice post. it is very unique and interesting.